I’m going to refer all folks that want to know about the EA-6B to the following link: http://www.globalsecurity.org/military/systems/aircraft/ea-6.htm I’m doing this because I think any views I put down will be highly subjective. Why you ask? It’s after having flown the Prowler for almost seven years, I’ve grown a certain affinity to it. Go to the link, and you’ll get a great description of one of the most important planes in our nations inventory. Important because no strike aircraft, from the B-2 and F-117, to the F/A-18 and F-16 is going into harms way without an EA-6B protecting them. The small number of planes lost since the Prowler has been accompanying strikers can be attributed to their ability. But enough of me and my soapbox, on to the model! When first opening the box, you’ll notice the model is bagged in two different bags. Also included is a clear sprue and tinted one for the canopies (more on this later), instructions and a decal sheet. About the easiest way to correct the multitude of errors on this kit is to pay the $40 for the Cutting Edge EA-6B Correction Set. Other aftermarket options will allow you to fold the wings, drop the flaps and slats, and don’t forget the great Black Box cockpit if you want the latest and greatest variant. Seamless Suckers has a set of intakes available now that will also help fix errors on the intakes. A number of aftermarket decals have been issued in the past few years, and they have helped make this a highly sought after kit (I’ve seen them go for as high as $100 dollars on E-bay!). 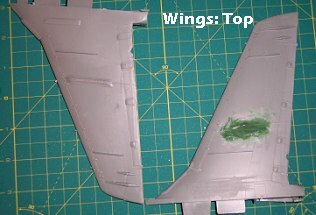 The Cutting Edge resin bits were then added to the top and bottoms of the wing. The slats will have to be rescribed to the correct length and shape. 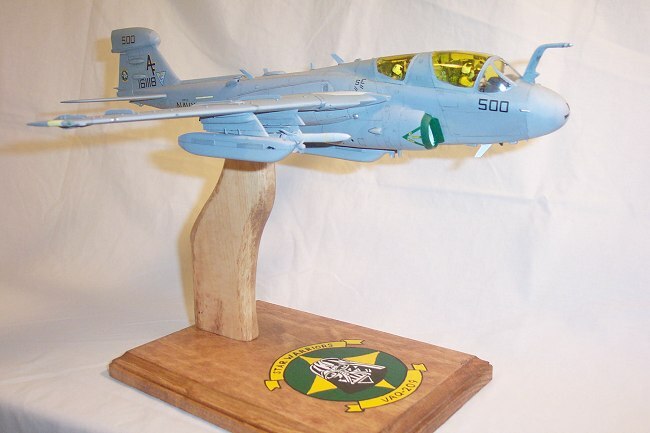 The main landing gear doors are also from the A-6 kit and are incorrect—the Prowler has another aerodynamic fairing that extends the length of the door. CE provides gear doors to correct this. The surgery continued on the fuselage halves. Using the motor tool I ground off the armor plating on the engine bays and underneath the rudder. Again this is common on the A-6 not the Prowler. 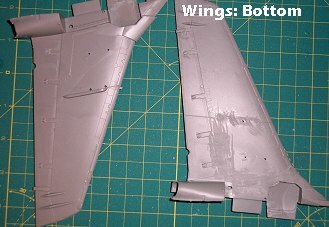 Continuing on, I removed the ALQ-126 coffee can on the tail section. Next I trimmed off spine for the HF antenna. The half round shape portrayed by Revell is incorrect, it is triangular in shape. I also trimmed off the NACA airscoops, which just don’t look right. All these bits are included in the CE correction kit and were glued in place. 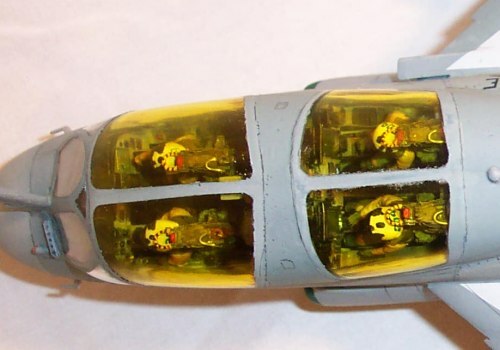 The Revell cockpit is a good representation of an ICAP I bird. However I planned on doing a current aircraft. The Black Box cockpit provides an AWESOME example of an ICAP II (Block 82/86/89) cockpit—no kidding when I opened the box for the first time I was literally looking for the Grumman logo on the rudder pedals! I can’t say enough good things about it. The resin cockpit tub needed some work with the motor tool in order to mate it with the fuselage halves, but that was the only extra grunt work performed. The GRUEA-7 Ejection Seats are simply superb—all I did was attach brass handles. On the Prowler, the firing mechanisms on top of the ejection seats are color coded to help the aviators ensure that the correct seat has been installed. The seats were painted the appropriate colors, (white for the left rear seat; orange for the right rear seat; purple for the right front seat; brown for the left front seat) and installed. I included the four-man crew complete with squadron appropriate helmet markings. 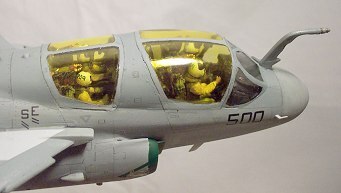 The intakes on the Prowler have a little step to allow the aircrew a place to stand when climbing up to the front cockpit. Again, the intakes provided are from the A-6 and are not correct. I glued a strip of styrene on top of the intake and faired it in with Green putty. The canopies on the EA-6B have a gold coating on the inside to protect the aircrew from being radiated while jamming. Revell tried to replicate this by providing the two types of clear sprue. I don’t think the tinted version is realistic enough, so I used the clear canopies and painted the insides with a clear yellow. (I haven’t fond a suitable match for the gold color yet, however this is the best result I’ve been able to come up with.) A strip of styrene represents the canopy framing complete with the grimes light hanging in the center. The canopies don’t fit so well in the closed position, so even more putty was required to fill the gaps. After all the sanding I polished the canopies with 12,000 grit sandpaper and masked them to prepare for painting. The last little bits of construction were centered on the ALQ-99 jammer pods and the AGM-88 HARM. 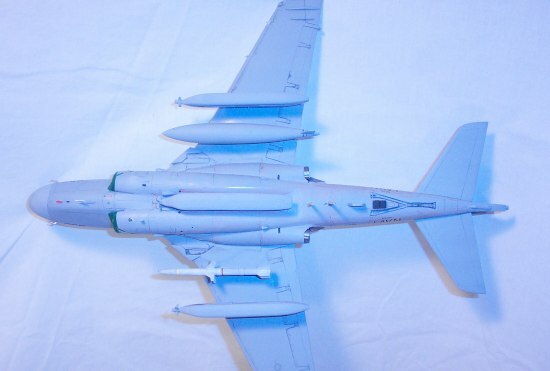 The pods included in the kit are ALQ-76 pods from the EA-6A, which again aren’t correct for the Prowler. The CE correction kit includes new pods, pylons and the spacers used when mounting the pods. 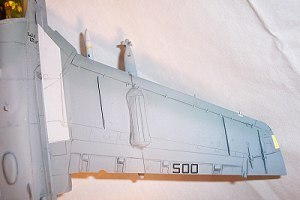 The pylons were glued to the wing with CA and the jammer pods had bits of wire attached to help facilitate attaching them after painting. I purchased a HARM from Cutting Edge complete with the LAU-118, and prepared that for painting as well. I wrapped up the construction with a few minor odds and ends (as if I hadn’t done enough cutting, gluing, puttying and sanding at this point). The in-flight refueling probe on the Prowler is canted 12º to the starboard—it was straight on the Intruder, so I cut it off and re-glued it appropriately. I installed a strip of styrene drilled with several holes in front of the pilot’s windscreen for the rain removal system. I also installed the USQ-113 antenna underneath the fuselage. I glued new chaff buckets just behind these—the Prowler carries these very un-aerodynamic dispensers to accommodate certain types of chaff and flares. Finally after all the time spent correcting the deficiencies, I was able to move on to the painting. I painted the model with Model Master enamels in the three-tone TPS scheme using Light Ghost Gray, Dark Ghost Gray and Medium Grey. As with most Naval aircraft, this particular aircraft is heavily faded and has suffered from the constant Corrosion Control efforts. While painting, I took time to mask off the radome and paint it with a lighter shade of Light Ghost Grey. The radomes are made of fiberglass and often need replacement if a drogue hits them while refueling, hence the many different shades often seen. I also misted over several other panels for the same effect. In preparation for the decals, I gave the model a coat of Testors Gloss Cote. 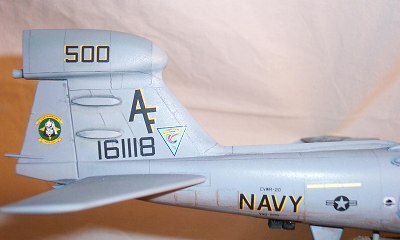 I used CAM decals sheet, 48-101 that included markings for VAQ-209. 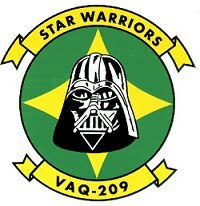 The sheet is accurate for the time frame depicted, however VAQ-209 is stationed at NAF Washington DC (otherwise known as Andrews AFB), not NAS Whidbey Island as noted on the sheet. After I finished with the decals, I sprayed another coat of gloss to seal the decals. I usually scribe all the panel lines, however to save some time on this kit, I just penciled in the lines with a mechanical pencil. To soften up the edges I sprayed a highly thinned mixture of gray, which also helped replicate the highly faded paint on this aircraft. I followed all this with some Flat Cote to seal everything. I finished the kit by attaching all the ALQ-99 pods, drop tank, HARM as well as various antennas. The antennas used on the Prowler vary widely from style to color, so you need to check which aircraft you are modeling. Again the CE correction set provides all the different styles you could need. Finally, with all the construction finished, the plane was attached to it’s display stand. In all, I spent about 27 hours on this kit, with the majority of them spent fixing the most obvious errors on the kit. 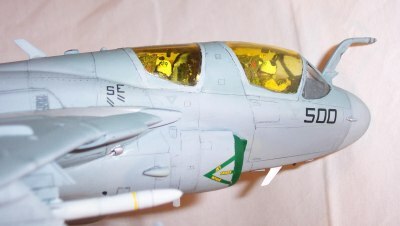 Monogram’s EA-6B is a pooch to put it bluntly, but with a little help from Cutting Edge, you can make a decent kit into a great kit. Monogram is supposedly reissuing it in a few months, so I can say that I’d recommend it to all—I know I’ll be picking up my share! I’ve been helping the author of several Squadron Signal books on his efforts to produce a Walk Around on the EA-6B Prowler which will hopefully be coming out soon—it’ll be a great reference for building this kit. A-6 Intruder in Action, No 138, Squadron Signal. Super Carriers by Tony Holmes at Osprey Publishing has some great shots of the EA-6B which not only show the antenna position, but what the effects of corrosion control on the paint scheme. World Air Power Journal Volume 30 - Contains a 15-page article with full color pictures of numerous aircraft and text discussing the various versions of the Prowler. Good reference for recent colors and markings circa 1997.